Are you planning a toss? 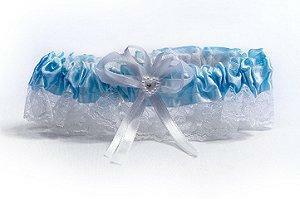 Garter and bouquet traditions are often included in American weddings, regardless of race or religion. Here's a refresher course of these classic wedding rituals, as well as a couple of alternatives if you aren't planning on the traditional route. The traditions are simple - the groom takes the garter off the bride and tosses it to waiting groomsmen and eligible bachelors. The bride takes her bouquet and tosses it to her bridesmaids and any other available women. In the past decade, however, wedding coordinators have seen a decline in these two traditions as brides are more likely to strive for originality over tradition than ever before. Still, more than half of today's weddings include garter and bouquet traditions, continuing their popularity at receptions. The garter and bouquet tossing began in the 14th century, with single men crowding around to catch the garter and single ladies vying for the bouquet. The legend dictates that whoever catches the toss will be the next to marry. One obvious pro of incorporating a garter and bouquet toss into your wedding reception is that it's simply tradition. Many guests will be expecting it, especially those of older generations. Like the cake cutting or father of the bride speech, the toss is bound to be a favorite for some of your attendees, and eliminating it may come as a surprise. Since both older and younger wedding guests will be familiar with the toss, this tradition may help bridge generation gaps and ensure everyone enjoys your reception. Another great reason to toss - it's an irreplaceable photo op. Your girlfriends in nice dresses, dive bombing the bouquet as it lands in the singles crowd, the men acting cool at first, only to put up as much of a fight as the ladies toward the end. You will have photo album material with all the laughs, shouts, and grins as the bouquet and garter are tossed toward the liveliest section of wedding guests. Finally, it is one of few chances to get your guests involved at the reception. Most wedding days consist of the bride and groom making the rounds while guests sit, eat, and begin to zone out through endless DJ spins. A toss is a great way to get at least some of your guests out of their seats, either to catch or snap photos. It can liven up the party and be a memorable midday activity for your reception. While participation is often a pro, some guests will just not want to get involved. Some will think it to be childish, while others will not want to advertise to the masses that they are still single and looking. This is especially an issue for older guests. Other engaged couples leave the tossing out of the reception because it often interrupts the dancing. If your friends and family can really cut a rug, you may not want to break up the party for a tradition that isn't very special to many. Finally, if you are serving alcohol at your reception, there is a large risk for intoxicated guests starting a brawl or fight over the garter and bouquet toss. You may get a memory you didn't anticipate. If you do decide to include a toss, you can set some ground rules to keep things within the confines of what you'd like to see at your wedding. You can keep the garter toss discreet by positioning it beneath your knee, or you may also want to double up the tradition with another activity that doesn't leave guests out of the action, such as an anniversary dance. For the bouquet toss, you can use a smaller toss bouquet instead of your large, and possibly awkward, bridal bouquet. Some couples choose not to incorporate either toss into their celebration. That is your decision, and there are lovely alternatives, particularly for the bouquet toss. Instead of throwing your flowers to the crowd, you can present it to your parents and new in-laws, offer it to the couple who has been married the longest, or give it to the next engaged couple. There are many garter and bouquet traditions that couples can observe, but if you are not comfortable with the common traditions you can easily create your own unique options. Instead of feeling bound by tradition, use the opportunity as another way to make your wedding even more memorable and special.